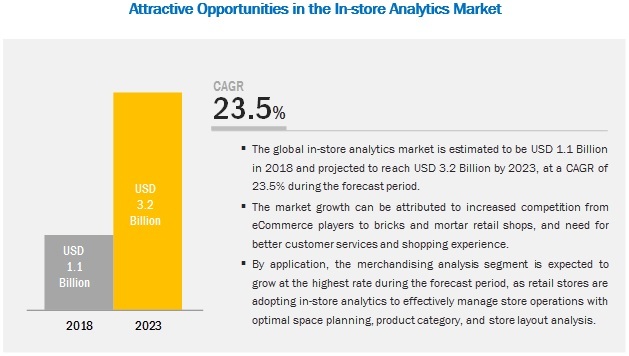 [124 Pages Report] The in-store analytics market size is expected to grow from USD 1.1 billion in 2018 to USD 3.2 billion by 2023, at a Compound Annual Growth Rate (CAGR) of 23.5% during the forecast period. Factors such as a rise in the data volume around in-store operations increased competition from eCommerce players to bricks and mortar retail shops and need for better customer services and shopping experience are expected to drive the adoption of in-store analytics software and services. Moreover, the penetration of smartphones and the Internet, high growth potential in emerging economies, and the advent of cloud-based analytics are expected to create ample opportunities for in-store analytics solution vendors. The in-store analytics market by component covers software and services. The software segment outperforms the services segment and would see growth in the future, due to higher adoption of software. The in-store analytics software enables stores to monitor sales for identifying customer preferences and developing business plans accordingly. Through early identification of trends and anomalies, stores can also predict risks, such as shoplifting and OOS situations. Furthermore, emerging technologies, such as AI, and integration capabilities of in-store analytics software have facilitated prediction of customer demand in real time. Consulting services mainly steer around the critical issues and opportunities related to strategies, marketing, operations, technologies, mergers and acquisitions, and finance, leading to increased effectiveness, improved performance, reduced costs, and enhanced resilience. Consulting services are required by retail stores, retail planners, and merchandisers for enhanced strategic outlook, improved performance efficiencies, and transformed business operations of retail-related activities into more efficient and cost-effective operations. The on-premises solution provides organizations with full control over the platform, applications, systems, and data, and these can be handled and managed by the organization’s own IT staff. The growth of the on-premises deployment model is mainly attributed to the flexibility for customizing the software as per an organization’s dynamic requirements. The store that handles customers’ credentials would prefer the on-premises deployment model, as the systems can be controlled by the organization’s staff themselves. Retail stores where data security and privacy is the main concern usually follow the on-premises deployment model. The global in-store analytics market by region covers 5 major geographic regions, namely, North America, Asia Pacific (APAC), Europe, Middle East and Africa (MEA), and Latin America. North America is expected to account for the largest market size during the forecast period. The adoption of in-store analytics solutions is expected to be the highest in North America, as compared to the other regions. This is mainly because of the presence of various developed economies, such as Canada and US, and the increasing focus on innovations obtained from R&D and technology. The retail market in the US is one of the largest with the presence of retail giants. 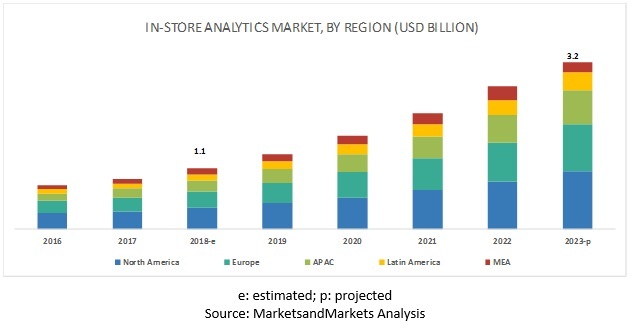 The in-store analytics market comprises major solution providers, such as RetailNext (US), SAP (Germany), Thinkinside (Italy), Mindtree (India), Happiest Minds (India), Celect (US), Capillary Technologies (Singapore), Scanalytics (US), Inpixon (US), Retail Solutions (US), Dor Technologies (US), SEMSEYE (Lithuania), InvenSense (US), Walkbase (Finland), and Amoobi (Belgium). The study includes an in-depth competitive analysis of these key players in the in-store analytics market with their company profiles, recent developments, and key market strategies. In January 2019, Thinkinside added a new module, Funnel Analysis, in its in-store analytics platform, RetailerIN. This module enables supermarket and grocery stores to fully analyze the complete shopping funnel by integrating sales data. In January 2018, RetailNext introduced new performance dashboards in its smart store analytics platform that integrates directly with its user interface and enables retailers to increase store management effectiveness and efficiency with the help of predictive and actionable insights. What are the opportunities in the in-store analytics market? The study involved 4 major activities in estimating the current market size for in-store analytics software and services. Exhaustive secondary research was done to collect information on the market, peer market, and parent market. The next step was to validate these findings, assumptions, and sizing with the industry experts across the value chain through primary research. Both top-down and bottom-up approaches were employed to estimate the complete market size. Thereafter, market breakup and data triangulation were used to estimate the market size of segments and subsegments. In the secondary research process, various secondary sources, such as Bloomberg and BusinessWeek have been referred for, to identify and collect information for this study. The secondary sources included annual reports, press releases, and investor presentations of companies; white papers; journals; and certified publications and articles from recognized authors, directories, and databases. 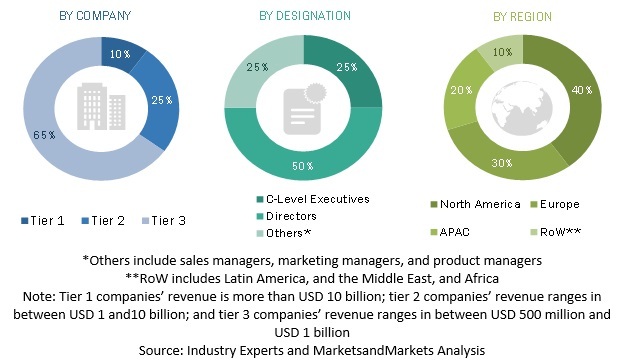 To forecast the market size of the market segments with respect to the 5 main regions, namely, North America, Europe, Middle East and Africa (MEA), Asia Pacific (APAC), and Latin America. This research report categorizes the in-store analytics market based on component, application, deployment model, organization size, and region.